Cooking with real wood smoke from smoking wood or a firewood fire is the ultimate in outdoor cooking. The flavors and aromas several varieties of savory aromatic woods can greatly enhance your raw ingredients. As I've mentioned elsewhere and you probably already know, the most widely available and familiar wood types for smoking are mesquite and hickory. However, wood types don't end there! Just about any wood you can cook with can also be used as chips or chunks as a source of aromatic smoke. 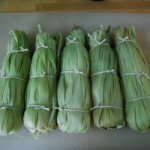 The total list is vast, but below you will find a list of many of the most common, and best, woods which you can find and use to smoke your food, either on a charcoal grill, smoker or even in a smoking box on your gas grill. You will see that many of these types are the same woods which are great for cooking over if you are cooking over a real wood fire. Several of these types can be found in grill specialty shops in your local area but others are also available online. Fire Pit Cooking Over Real Hardwood Fire - Cooking over good hardwood embers or an open fire is probably the ultimate way to get real, rich wood smoke flavors into your food. However, this takes a longer time to build the fire to a point you can cook over and can require fire pit accessories we don't all have. 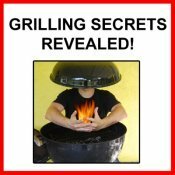 Cooking on a Charcoal Grill - Good hardwood lump charcoal does impart a nice wood smoke flavor to food, but to really get intense smoke flavors smoking wood chips or chunks can be added to the charcoal to develop a thick, rich and aromatic wood smoke. You can add the wood directly to the hot charcoal or place it in a smoker box. 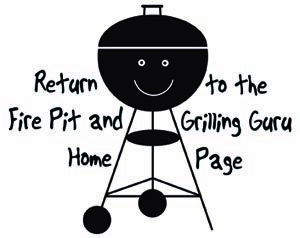 Cooking on a Gas Grill - Gas grills don't supply any wood smoke. However, with a smoking box you can add chips of smoking wood which will give off real wood smoke as they heat up in your grill. 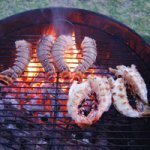 Cooking in a Smoker - A smoker is basically a charcoal grill which is optimized for slow cooking over low heat with smoking woods. You can get the same results with a good charcoal grill if you cook over indirect heat and add aromatic smoking wood chips or chunks to the charcoal. Adding Liquid Smoke Flavoring to Your Food - Many brands make liquid smoke flavor additives which can be added to marinades or sauces. While these are created by real wood flavors, purists will argue that they can never compare to real wood smoking. However, for indoor grilling it may be the only way you can get smoke flavors into your food unless you are lucky enough to have an indoor wood-burning oven. Alder - Delicate flavor with only a hint of sweetness. Good with lighter flavored foods like fish, pork, poultry and some game birds. Almond - Sweeter smoke flavor which is great with most meats. Apple - Mild, mellow, and subtle with a slightly sweet flavor. This is great with poultry and pork. Cherry - Mild and fruity. Also great with poultry, pork and even beef. Grapevines - Very dense smoke but it is rich and fruity flavored. Excellent accompaniment to rustic poultry, red meats, game and lamb. Hickory - This, along with mesquite, is one of the most common and popular smoking woods. Sweet but quite strong and almost has a bacon-like smoke flavor. Good with full-flavored pork, ham and beef preparations. Maple - Slightly sweet and mellow. Accents pork, poultry, and most game birds very nicely. 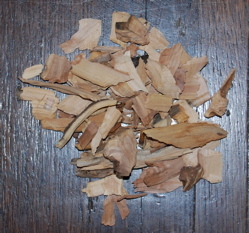 Mesquite - Another of the most commonly used smoking woods. Strong earthy aroma which if too intense can be mellowed by combining with other more mellow woods like apple or cherry. Can compliment beef, fish, chicken and game nicely. Mulberry - Slightly sweet and not dissimilar to apple. Oak - Very heavy smoke flavor. Good with red meat and pork (particularly on ribs!) as well as fish and heavy game. Pear - Subtle, mellow and sweet flavor similar to apple. Very good with poultry and pork. Pecan - Somewhat like hickory but with a bit sweeter and milder flavor. Excellent with poultry, beef, and pork.